Let me start by saying that I hardly, ever, *ever* buy pre-cuts. The are a relatively new phenomenom and I don't have any patterns that specifically use them. When a pattern calls for X yardage, it's difficult to translate that into pre-cut units, so although I may admire them, I pass them by. While I waited for him to pick me up, I wandered into the vendor building, one more time. I was just going to do a quick circuit to pass the time. Since it was so close to closing time, the vendors were just marking time before closing up shop> So, instead of a fly-by, I was able to spend quite a bit of that time chatting with one of the vendors. She seemed happy to spend the time talking about "anything". Another late quilter wandered in and looked at the pre-cuts, selected one and bought it. It was a drop-dead, *gorgeous* selection of turquoises and I said as much. The vendor commented that there was only one more of that pre-cut left. Back at the homefront, I began to do some research on how best to use this pre-cut. One such website was Hoffman Fabrics and there was a perfect pattern on their free download page. 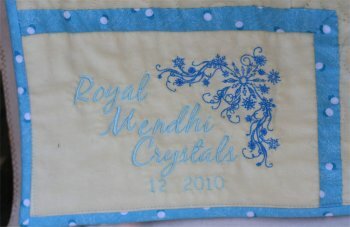 Mendhi Crystals is offered in two colorways: a multi-color and a neutral. (Both of those links will give you a PDF to download and save.) I thought the pattern would be suitable for my pre-cut, although I did end up altering the layout to accomodate the fabrics that I had. 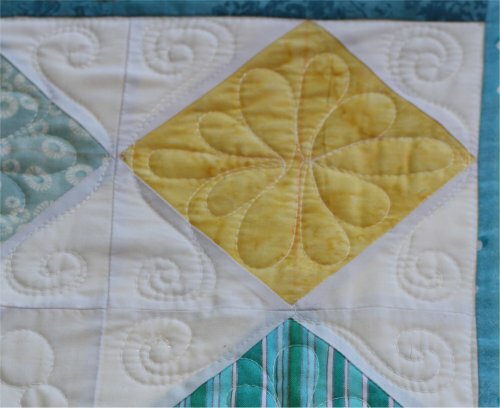 I augmented the pre-cut with some of my own turquoise fabrics and a highlight of sparkling yellow. The pattern went together without a hitch, even with my alteration and the top was quickly completed. And sat in my pile of Tops to Quilt. For a long time. Why? Well ... True Confessions time: piecing is easy for me. I love to piece. I get on a roll and just churn out the tops. Pretty soon, I have a stack of tops that need quilting and I know I need to work on them soon otherwise, I'm going to forget details of how I made the quilt. Usually, I create a notefile for the quilt as I'm working on it so I don't have to keep all the pertinent details stuffed in my head, but sometimes I forget about the notefile. So, anyway, I wasn't in a mood to quilt .. I wanted to work on tops .. so I did. 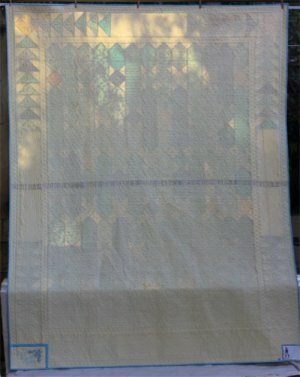 There was a small mishap on backing: I had *yards* of vintage flannel from Mom's stash, it was a soft, butter yellow. There was more than enough for the backing and I was pleased to be able to use it. I needed to cut it 100" long, 2 sections at WOF. I measured. I measured twice. I cut once. I fluffed it out and thought ... 'that looks kinda short'. Then realized that I *forgot to double the fabric over* at the 100" mark. I had used the 50" mark instead. duh. (Obviously, I had intended on unfolding it at the 50" mark to have one piece at 100" .. then double it at *that* mark to get two 100" sections.) So instead of having two 100" long pieces, I had two 50" long pieces. aaarrrggghhh. I still had enough for the backing (since I cut it overly long) but now I would have nasty, nasty horizontal seamline in the middle. Yuck, yuck, yuck! To help disguise it, I inserted a coordinating piece of woven cotton (since I had no flannel that would be suitable). ::sigh:: What a doofus. But, such is life and I'll call myself lucky if that is kind of bad luck I have. From Quilter's Rule booth, I found a template for Nested Mini-circles (1" - 4"). You know how, when you are following a circular template on a longarm, you can stitch about 3/4's the way around before your arm physically gets in the way? Then you need to stop your machine, make sure it *stays put*, reposition your hand/arm and restart the stitching ... and try not to have a bobble at the re-start. Sometimes you don't always succeed. Well, the strategy of these templates is that you can stitch the circle on the INSIDE the template so that your hand never gets in the way and you never need to reposition it on the template to complete the circle! Awesome! Sold! 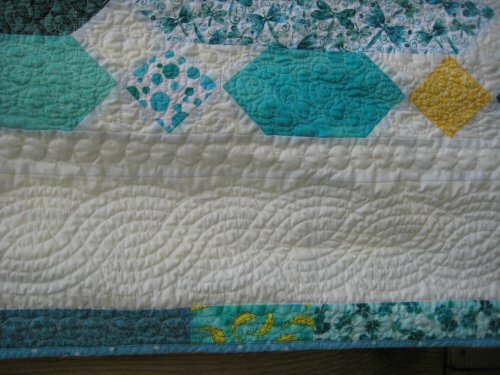 As part of the sales technique, we were shown how to do a String of Pearls quilting design easily ... oh. my. gosh. Awesome! Sold! (In this picture, you can see the chalk guideline I put down to help me center all the circles). Then ... Oh. My. Gosh. There was a cable template. I love, love, love the look of cables. But how on earth do you do them as continuous stitching? That mystery was way beyond what my poor one brain cell could contemplate. But Nancy Johnson, who obviously has more than one brain cell, HAS figured it out with this exceedingly clever 5 line cable template. The template has a bunch of removeable pieces which allow you to stitch the cable, for as long as you need it to be, in *one continuous line*. Yes, there is a small amount of back-tracking, but the template helps you stay on track with that part. Being the idiot that I am, I didn't practice beforehand. Oh noooo ... that would be too simple! I just jumped right in and use the template for the first time on this quilt. I found out that I had misjudged my guideline and the resultant cable (which looked FANTASTIC!) wasn't centered properly on the border. Eh ... ::shrug:: .... minor problem. I can't wax enthusiastic enough about both of these templates! I'm sure that these quilting motifs could certainly be done without a template but for it to *look* good, I need the help of templates. I'm sure glad that I have them! 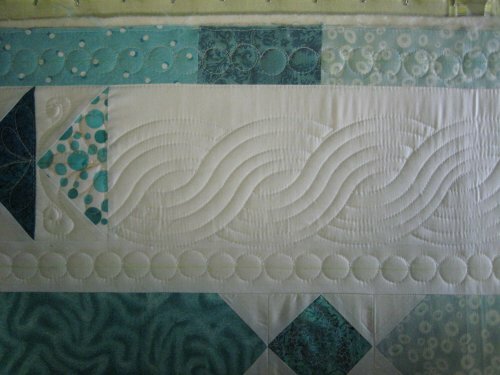 The quilting in the center part of the quilt was a pantograph by Lorien Quilting, "Halcyon". It's a very nice curvilinear design that I thought would soften the very angular look of the piecing. By using blue painters' tape to mark where the edges of the center medallion was, I was able to do this pantograph *just in the center* of the quilt. 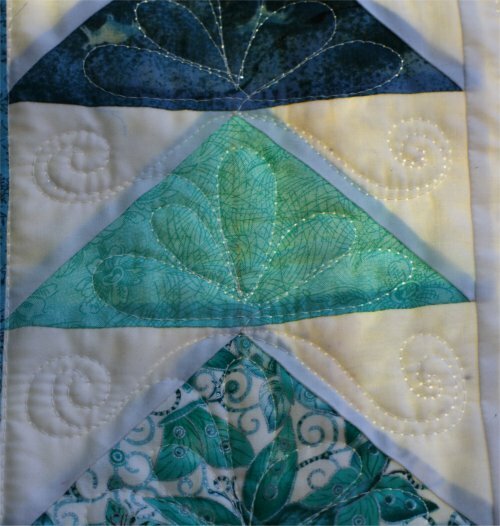 The Flying Geese got a Carla Barrett quilting treatment. 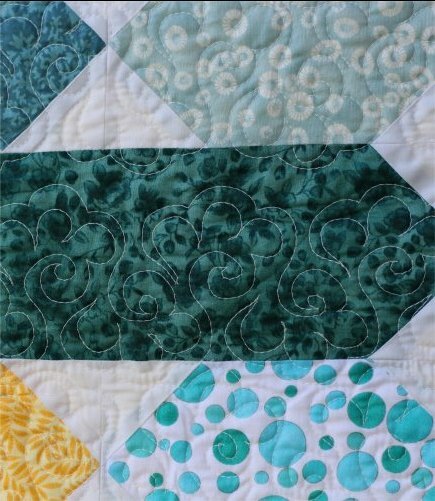 I just love, *love*, LOVE Carla's quilting and she is most generous with tutorials. 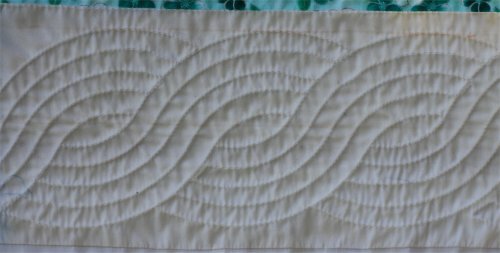 Carla has this wonderful design that allows you to quilt a perfectly suited motif for a string of Geese. I love how the design flows so wonderfully from block to block ... it's an extremely easy design to free motion. As far a labels go, I have a 'standard' pirate label I put on my quilts. She's my alter-ego and how I really view myself .. no matter WHAT the mirror might actually reflect. [grin] I like to hand write the verbage on the label, along with my signature; I think it lends a personal touch. Here's how the quilt looks after it was laundered. I have to admit, once again, that although I always prewash my fabrics, I don't always shrink the batting before using it. It only stands to reason that the batting is going to shrink to some degree. 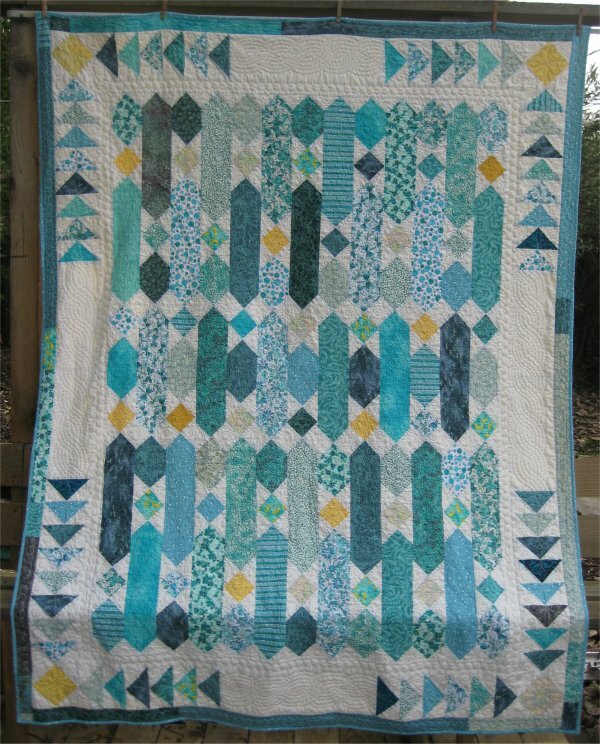 When the quilt is on the frame and the quilting is *so* crisp, defined and clean, it looks simply fantastic. A lot of people like the old, timey wrinkled look, but I'm not a overwhelming fan about it. I'd love it if my quilting could stay as crisp as it looks on the frame, but that's not gonna happen. 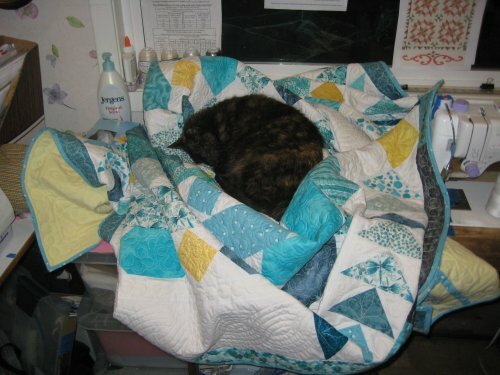 And what quilt would be complete with a *thorough* inspection for Quality Control?